Brown long eared bat just before being released. All of our British species feed on insects, roosting in trees, caves, mines and a variety of buildings. Bats sharing your home pose no health hazard. They do not build nests, gnaw wood, chew cables or insulation. They are not blind and will not get tangled in your hair! Britain has approximately 65 species of mammals and 18 of these are bats. 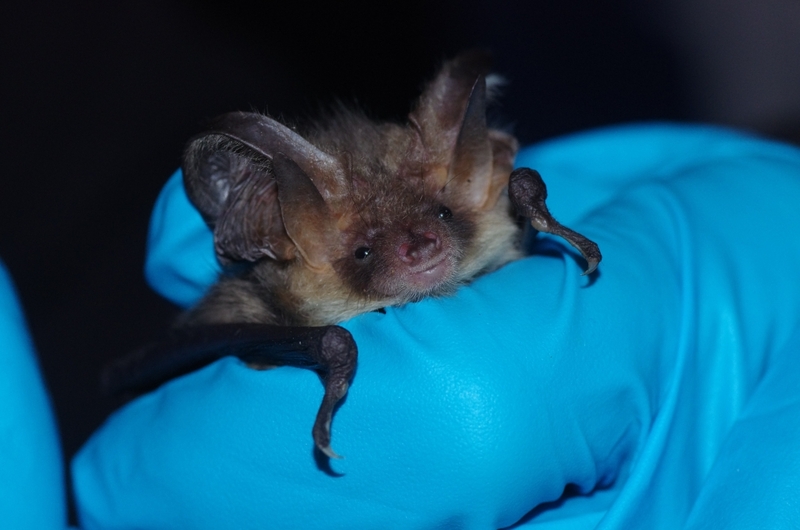 16 bat species have been recorded in Devon. Some of these, such as the Greater and Lesser Horseshoe bats, are extremely rare. Their numbers in Devon are of national importance. As recently as the 1950s, colonies of thousands of bats could be seen. Today colonies of such numbers no longer exist. Even our more common species appear to have declined. Decline is the result of many factors. Toxic timber treatment chemicals and breathable roofing membranes (BRMs) in lofts can be fatal to bats. Roost sites are lost through misunderstanding, vandalism, blocking of access holes, mine capping and tree felling. Habitat destruction and changes in agricultural practices have also meant a decline in both the numbers and variety of insects on which bats feed. Bats are long-lived compared to similar sized mammals such as mice. They reproduce slowly, typically having one baby (pup) every year or even every other year. They are also very faithful to their roosts, some sites having been used by colonies for hundreds or years. This makes protecting roost sites and habitat critical in helping to conserve these fabulous animals.